Award-winning novelist Michael Winter turns his hand to nonfiction in this gripping and uniquely personal book about the young men of the Royal Newfoundland Regiment who were all but annihilated 100 years ago, at the Battle of the Somme during the First World War--and the surprising political and social reverberations of that battle, which are still felt in Canada and in Europe today. This is history as only Michael Winter could write it--urgently alive, affecting and relevant. "So much has already been said about the Newfoundland Regiment and I don't want to rehash the existing record. Instead, the story here is the author following the trail of the regiment, visiting the places in England and Scotland where they trained, and then Gallipoli and France and Belgium where they fought, and finally Newfoundland where the survivors returned. At the centre of the story is July 1, 1916 and the battle at Beaumont Hamel, and at the heart of that is a man, Tommy Ricketts, who was the youngest-ever winner of the Victoria Cross in the British army, and who is a Newfoundlander." The evocative title, Into the Blizzard, is a quote from one of the witnesses to the sight of the young men walking into the storm of firepower at the Somme. 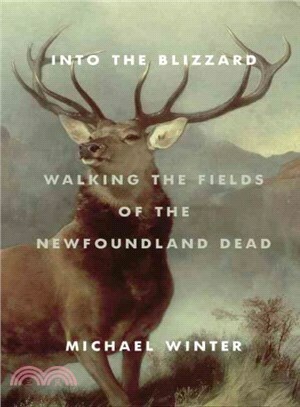 It also evokes experiences that are part of living in Newfoundland then and now--being out on the ice or in the outports, where blinding snowstorms can arise quickly and without warning--experiences that Michael describes as he searches for the stories of the lost young men.The subtitle, "Walking the Fields of the Newfoundland Dead," references how Michael has followed the lives--literally walking the fields they once walked--of a handful of the men from the legendary regiment, both in Europe and back home. The juxtaposition of "blizzard" with the more contemplative "walking the fields" and then the utter stillness of "the dead" hints at the tone of this extraordinary, unusual and moving book, and at the depth and poignancy of Michael Winter's take on this piece of history that, he reminds us, continues to haunt our own brief lives. MICHAEL WINTER is the author of a number of novels, including The Architects Are Here, which was longlisted for the Scotiabank Giller Prize, and The Big Why, which was longlisted for the International IMPAC Dublin Literary Award. The Death of Donna Whalen, was nominated for the Writers' Trust Fiction Prize and the Commonwealth Writers' Prize. He is also the recipient of the Writers' Trust Notable Author Award.